Never challenge the determination of a dedicated fan base. In 2006, George Lucas claimed that all quality prints of the 1977 theatrical release of Star Wars: Episode IV—A New Hope had been “permanently altered for the creation of the Special Editions” and that remaining prints were in too poor of a condition to restore. In 2016, a group of talented fans under the collective moniker Team Negative One accomplished precisely that, spending three years digitally cleaning and correcting a damaged 35mm copy to near-pristine condition in what they’re calling the “Silver Screen” edition of the film. Unlike similar fan projects such as Harmy’s “despecialized editions”—which used multiple sources to create a high-definition copy of the series’s first installment free of any post-1977 directorial tinkering—Team Negative One worked solely from the three original reels of the film. The difference between the two is more than philosophical (if a bit fine), as the 35mm restoration retains more grain, has some minor gate weave, and in general is less an attempt at a high-definition copy so much as a faithful recreation of the film’s theatrical appearance. 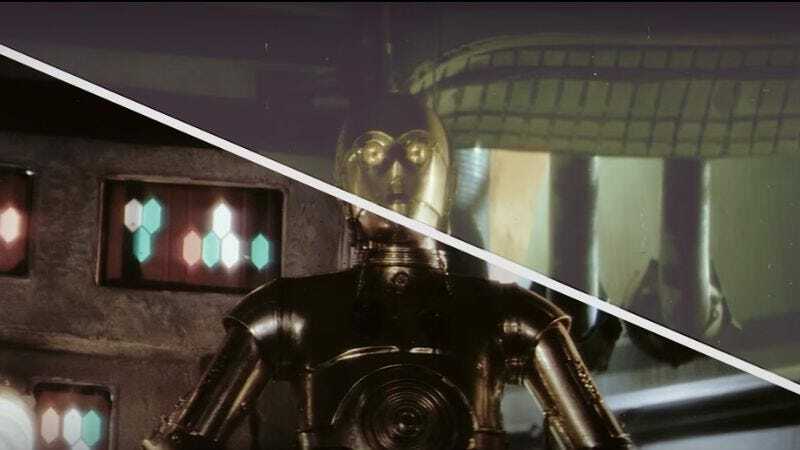 Both are worthy re-realizations of Lucas’s original vision, and the Silver Screen edition still stacks up pretty well against the official Blu-ray of the film, even with the advantages the latter had in being scanned from the original negative. There’s more info over at The Star Wars Trilogy, though those looking for a direct link to download the film may need to do some creative Googling.